Leading global crane company Tadano’s flagship all-terrain crane, the ATF400G-6 has arrived in Perth, Western Australia. 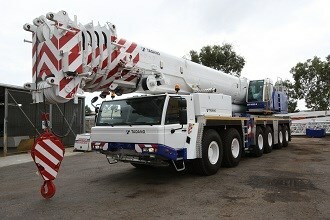 Tadano's new all-terrain crane, the ATF400G-6 has arrived in Australia to positive response. The crane is a six-axle all-terrain model and is the largest one to be produced at the Tadano Faun factory in Lauf, near Nuremberg (Germany). The company says the major appeal of the ATF400G-6 is the strength of the boom and its simplicity in setting up. Tadano Sales Manager David White says the model can do almost everything a crane in the 220-400 tonne class can do and represents a major advancement in crane technology. "The six-axle compact carrier (when fitted with up to 25 tonne counterweight) stays inside the 3.2m width which provides more manoeuvrability, less maintenance and more options," he says. 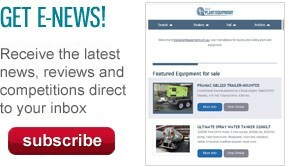 "And the main boom lifting chart of the ATF400G-6 is the equivalent or better than most 7 axle models." White says the Australian market's initial impressions have been very positive. "Our Tadano customers in Australia describe the new ATF400G-6 as the most versatile crane in the all-terrain segment that they have seen." Tadano says the new model will suit the crane hire operator working in the site maintenance and construction markets. Tadano adds the main boom alone has charts in excess of 40 per cent more than some competitors. Other features of the ATF400G-6 include powered luffing jib, Tadano's exclusive Lift Adjuster, a release adjuster load sway prevention, power system and Mercedes-Benz BlueTec engines. The company says the new engines make the crane the cleanest and greenest in its class. Tadano is a leading business in the crane industry manufacturing a huge range of lifting equipment including all terrain cranes, truck cranes, rough terrain cranes and Tadano Mantis telescopic boom hydraulic crawler cranes.